NMM 10467. Long drum, Britain, 1714-1727. Elm shell (measuring between 741mm / 30-1/4" and 753mm / 30-3/4" long with a diameter of approximately 590mm / 23"). Brass tack design reinforces glued shell overlap. 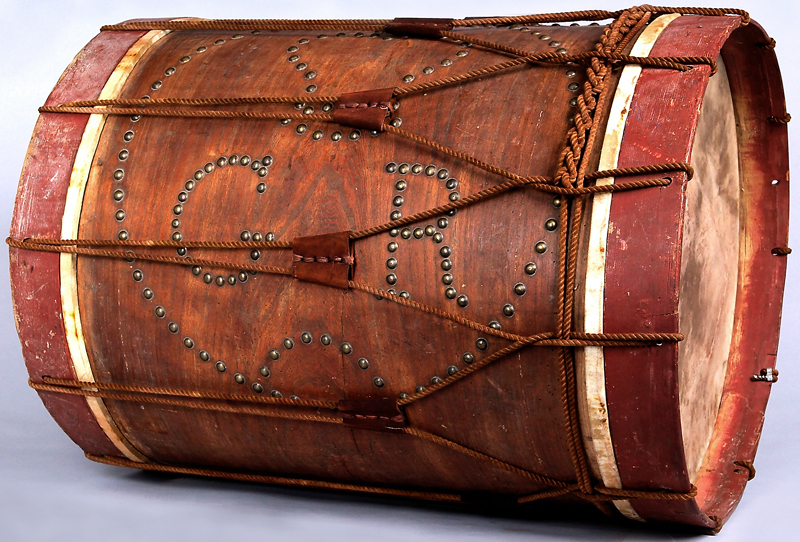 Design on overlap includes three parallel lines and two wavy lines, below which is a large circle with a crown and the letters G R (G = George; R = Rex) spelled out in tacks, indicating that the drum was built for the military during the reign of George 1st (1714-1727). Eleven leather tugs. Ash rims painted red with drilled holes through which the rope passes. Board of Trustees, 2003. This large bass drum was designed for use by a military band, but was not part of a fife and drum corps, which traditionally used side drums. British long drums (so called because the shell height was taller than the diameter) were played with a solid wooden beater held in one hand and a small stick (British, "switch") held in the other hand. The drummer's music included images of flags pointing either up or down to designate which hand was to be used to play each note. Strong beats were played by the beater, while the weak beats were played with the stick. 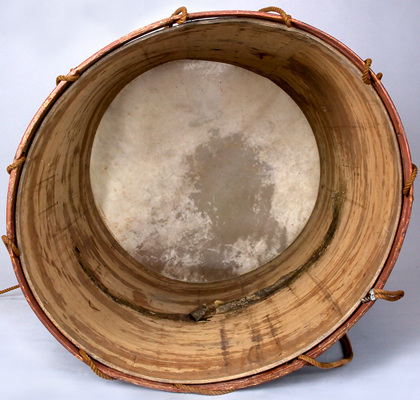 No scorch marks can be found inside the drum shell to suggest the use of direct heat to bend the wood; therefore, the shell must have been either steamed or, more likely, dipped in hot water before being bent around a form. Vertical lines created by such a form can be clearly seen in the image above. 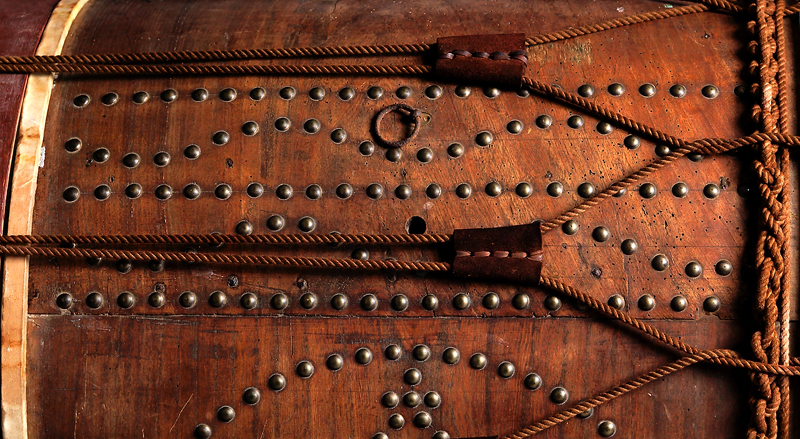 There are no reinforcing hoops or braces on the inside of the drum, nor has the interior been varnished or stained. Two cloth strips were later applied to reinforce cracks that developed in the shell. A brass tack design consisting of three parallel lines, with two wavy lines in between, reinforces the glued overlap of the drum shell. 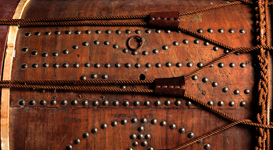 A rope would have been attached to the large, brass hook so that the player could march with the drum securely positioned across his chest. Lit. : André Larson, "Celebrating 30 Great Years . . . Sioux Falls Exhibition Crowns Another Notable Year," National Music Museum Newsletter 30, No. 4 (November 2003), p. 2.